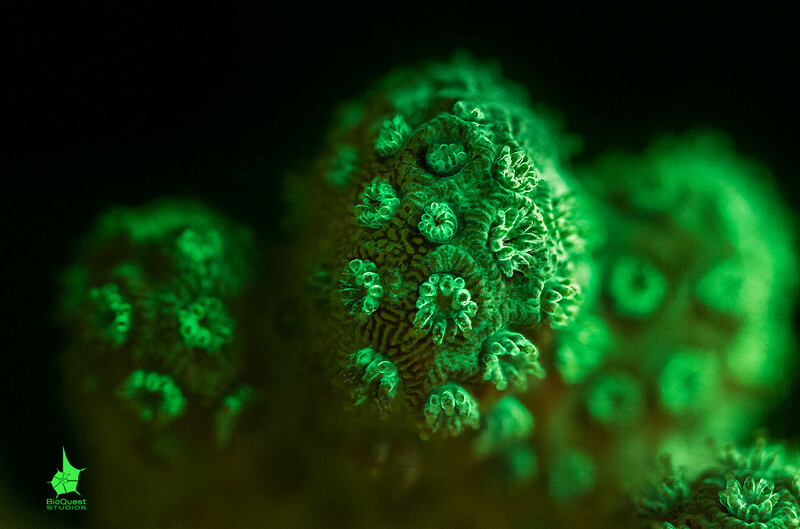 Great Barrier Reef invertebrates showing natural fluorescent glow. Narrow-spectrum fluorescence is produced with a set of optical filters. Pocillopora sp. emitting green fluorescence. This coral might be sick. The lower part of the coral has more red colors as the symbiotic algae didn't leave the polyps. The top part, however, shows signs of what looks like disease. However, these green patches are invisible without fluorescent imaging. In the middle of the photo you can actually see that the right part looks less healthy than the right one: the green patch is more noticeable and red colors are nearly absent.